Queer ecologies slither through the wanton matteriality of naturecultures, including the perversity of electrons, the polyamorous tendrils of lightning, the deep futurity of plastic, the trans-species animacies of xeno-estrogens, and the polymorphous fecundity of holobiontism, and on and on and on. O yes yes yes. 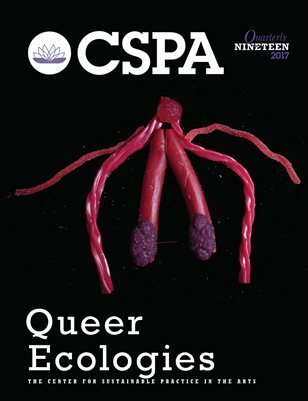 This issue invites you to writhe in the queer resistances of anti-normativity, anti-futurity and anti-reproductivity, the queer possibilities of performativity, diversity and kinship, and the precarity, intimacy and adaptability of evolutionary theories of sexual, natural and social selection and phenotypic plasticity. It slides through sustainability and slips into compostability, sifting through the transient, the fecund, the toxic, the permanent, the deviant, the perverse and the selective to unearth the spacetimematter of proliferation, extinction and thennowwhen. Guest edited by Tarsh Bates.